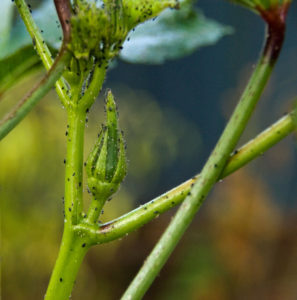 Its beginning of fall here in Oceanside, California and I’ve noticed some pests on my okra plant. They seemed like aphids to me at first but it looks like these something else! They seem to be sucking the sap and eating the leaves…not good at all. They are right at the apex of the okra buds. I don’t think there’s much chance that the okra can survive. 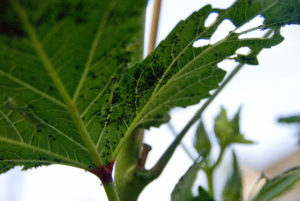 But I have noticed that okra in general has tremendous resistance to pests, especially whiteflies. One of our okra plants was infested with whiteflies but still grew healthy and produced a lot of okra! Greetings! I live in Houston TX, and just discovered bugs on my okra plants as well. They look like what is depicted in your photo. Dont much feel like getting dressed yet and running to store for spray, so tried a small amount of Dawn dish soap diluted in water in a spray bottle. I really gave them the business…right up until the dang spray bottle trigger broke. Sheesh those things are crappy these days. Anyhow, figured I'd let the bug/Dawn coctail bake in the sun for a while, then rinse. I'll let you know the outcome. Good luck to you.